A bedroom at this remodelled and extended house in Porto, Portugal, has been wrapped in cork to shield it from the noise of a nearby school playground (+ slideshow). Casa Bonjardim was designed by Porto studio ATKA Arquitectos for a couple, who wanted space to work at home and a second bedroom for their daughter, who visits regularly. The 85-year-old house was originally built with a timber frame and had a bulky concrete extension at the back. Both were in such a poor structural state that it had to be completely rebuilt, save for the front facade and side walls. "We asked an engineering firm to do several tests to see if we could preserve at least the timber sections, but a large amount of the wood was deformed, rotting, or had bugs, so we had no choice but to renew everything," architects Diogo Paradinha and Patrícia Moreno told Dezeen. The rebuilt house is 233 square metres and has the same narrow proportions as the original structure – 20 metres long and 4.5 metres wide – but it has been extended with a new level at the top. An outbuilding was also added in the garden to house technical equipment and provide storage. On the ground floor there is an open-plan kitchen, dining area and living room, and on the first floor there are two bedrooms and bathrooms. The top floor has a painting studio at the front and an office, terrace and internal patio at the back. The master bedroom on the first floor protrudes out from the back of the house and has been clad in cork to cushion it from surrounding noise, and provide insulation. "We used expanded corkboard to affirm this protruding volume, and suppress noise from a school playground nearby," said the architects. "Cork is entirely natural, and offers an alternative to more conventional forms of insulation, with a good acoustic and thermal performance." Portugal is a major producer of cork, and the material has been used to cover a number of buildings in the country, including a house partially built into a hill, and the world's first cork-clad hotel. Casa Bonjardim is supported by a steel frame and split into a series of stepped half levels. This helps to deal with the difference in height between the street at the front and the garden at the back, which is higher. "We wanted to create a sense of continuity between the living area and the garden, so we had two options – excavate the garden to make it lower, or raise the house," explained the architects. "Excavation would have been unsafe as the garden is adjoined by a large stone wall, and we could not raise the house entirely because we had to retain the front facade, so we came up with an intermediate solution of half levels." The half levels also allowed for a greater variety of ceiling heights throughout the house. They vary from 2.4 metres at the entrance to 2.8 metres in the kitchen, and rise up to 3.7 metres in the central stairwell. 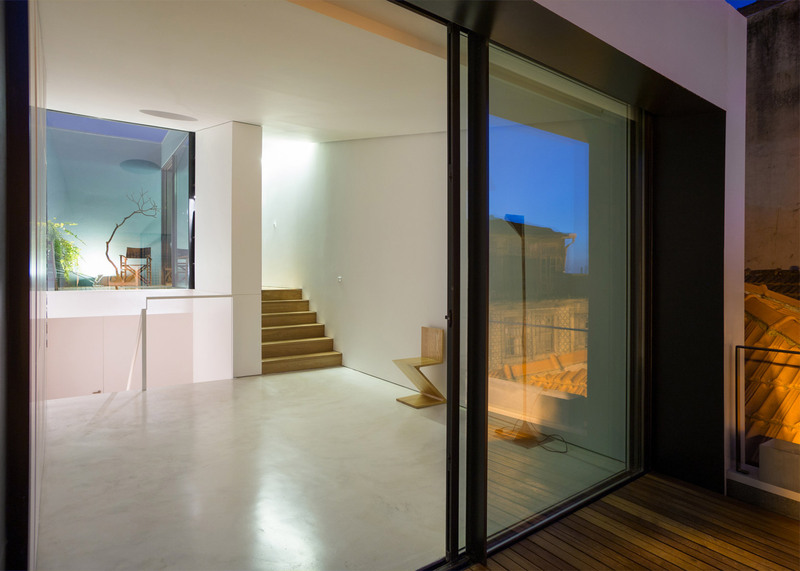 To maximise light in the narrow house, all rooms at the back were designed with full-height glazing. 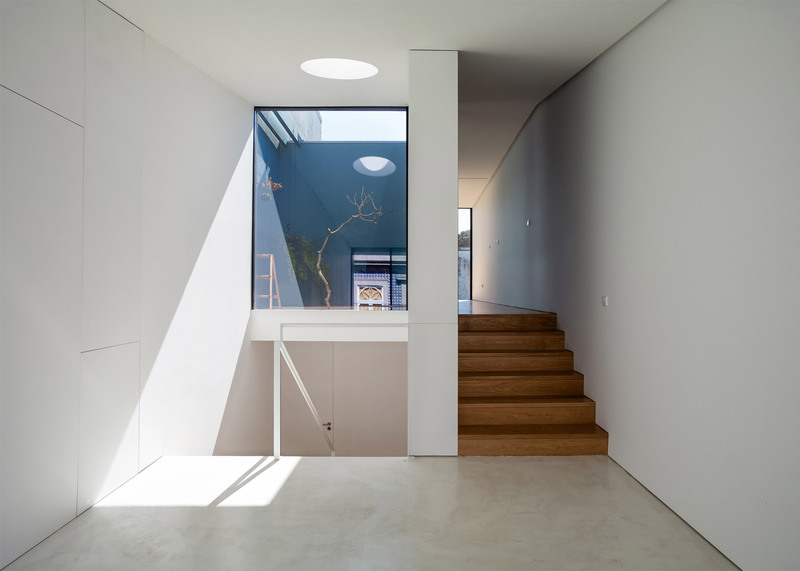 A circular rooflight was also added at the top of the stairs, and the internal patio on the top floor was fitted with a glass roof and an internal window to bring more light into the centre of the home. "The house faces west at the front, and east at the back, so the light is very horizontal when it is direct," said the architects. "To create a better flow of this light, we avoided barriers between the stairwell and the windows, and added the internal patio, which illuminates the central space until the middle of the afternoon." 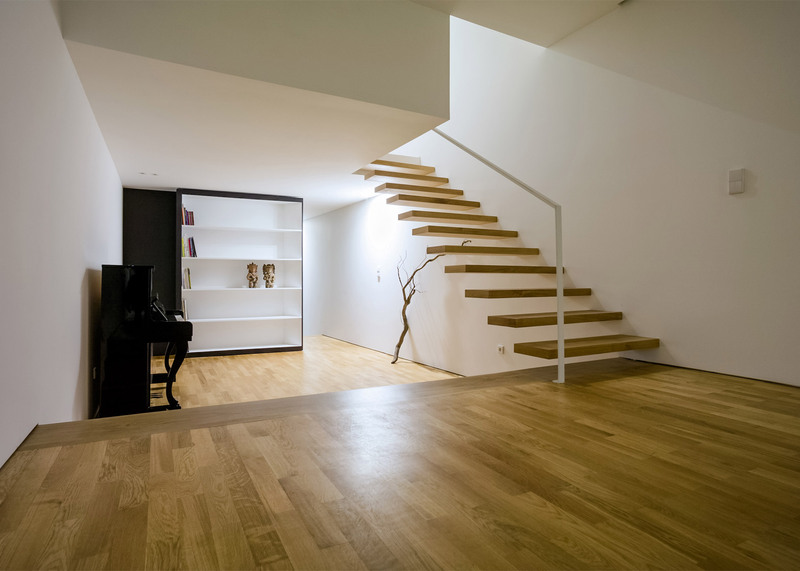 Oak flooring was used for the ground floor and study, chosen for the warmth of its colour. Concrete flooring runs through the painting studio on the top floor, which also features a wall of built-in storage. "Given the use of the painting studio, the owners wanted a surface that was neutral and easy to clean," said the architects. In the entrance hall, a black-painted diagonal wall has been added to conceal storage and a WC at the front of the house. The partition also shields the living space beyond from the gaze of passersby on the street. "The black absorbs the light, and offers a contrast with the white surfaces used elsewhere throughout the house," said the architects. Construction was completed in 15 months, and cost approximately €750 (£540) per square metre. 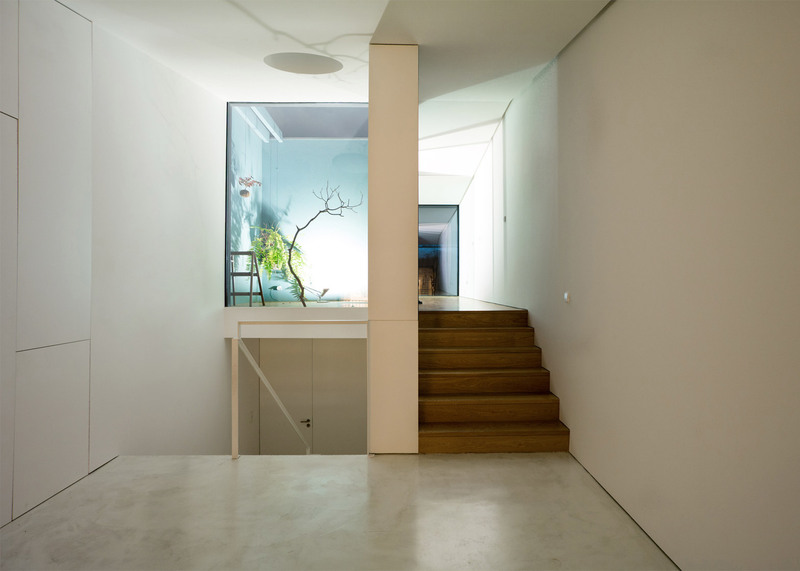 Photography is by ATKA Arquitectos.